Emily Neves as Marie Antoinette. Photo Credit: Amitava Sarkar. How’s this for a theater recipe? Take one part Paris Hilton (OMG/I’m SO much hotter than you), another part Hillary Clinton circa mid 90’s (the decisive and powerful woman often pulling the strings of her ruling husband) and mix in a dash of Legally Blonde’s Elle Woods (the smartest dumb woman in the room) if Elle could also drop F-bombs like a Jersey Shore gal. Now put her in a play that mashes up Baz Luhrmann/MTV-style short, visually assaulting scenes set to thumping club music with uber surrealist anthropomorphism (in the guise of a talking sheep) and a healthy dose of Shakespearean tragedy at its darkest. 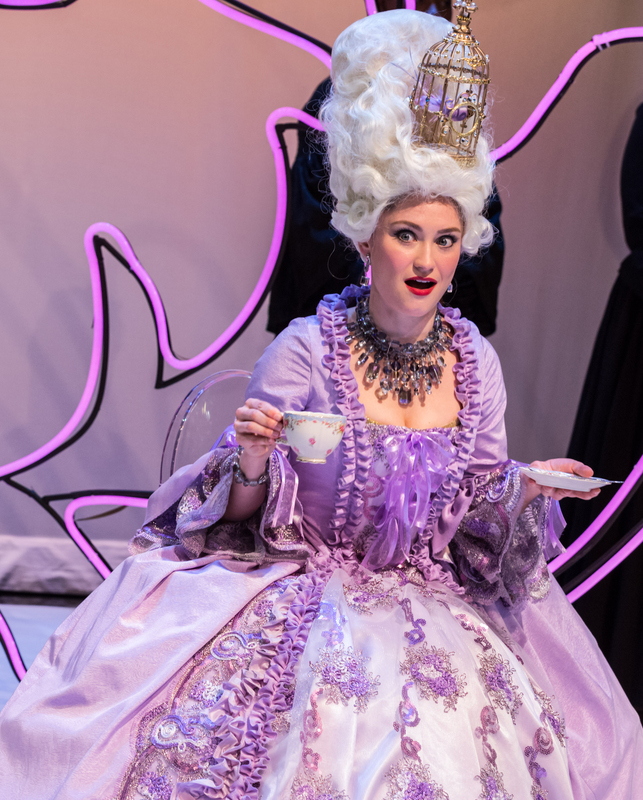 What you get is Stages Theatre’s wildly inventive production of David Adjmi’s Marie Antoinette. It might sound like one gigantic hot mess on paper, but against the odds and in many instances by the skin of its teeth, Adjmi’s play in Leslie Swackhammer’s astonishingly talented directorial hands, fizzes and pops and ultimately claws its way into our full enjoyment. Marie’s story is that of legend. A naïve Austrian royal married off by her mother at fourteen to the King of France as a political manoeuver. Drowning in luxury at Versailles, Marie reacts to her less than ideal husband, strange new home and stunted educational and emotional maturity by engaging in the ultimate and never-ending shopping spree, much to the increasing ire of the starving French people. When the revolution finally comes and the people oust the monarchy in favour of a seemingly more democratic rule, it is Marie that they detest the most and it is she that suffers most greatly for her excesses and insensitivity to their plight. It’s her head they want and ultimately her head they get. How one see’s Marie’s story is a matter of perspective. Was she an unsavvy and innocent victim of her fate or was she the epitome of selfishness that got what she deserved. Adjmi wants us to believe a bit of both, though it’s clear that his affections outweigh his derision for his main character. Marie Antoinette paints for us a character we can both love and be disgusted by. She is a woman who pays little attention to her son while at the same time whining over the grave damage her own absent mother caused her. She’s a woman who shows great character in turning down an affair because she believes in the sanctity of marriage, but is as quick to tell her husband that she never really loved him. These shades of grey in character study are nothing new and certainly not in the discussion of Marie Antoinette. What makes it work so superbly here is Adjmi’s combination of highbrow/lowbrow, using modern and period piece language to highlight the dichotomy. Marie is just as likely to spew expletives or pronounce, “Intellectuals – blech” as she is to wax beautifully about being in a ‘canard’ or musing philosophically about her value as a person. But no matter the amount of delightful brain gymnastics Adjmi gives us, this is a show that relies heavily on a strong creative vision to inject freshness into what is ultimately a well-trod story. When it comes to vision, Swackhammer and her production team have it in bucketfuls. Set on Ryan McGettigan’s minimal stage beautifully adorned with huge abstract neon doodles and repro Ghost chairs, Swackhammer moves her cast around with casual ease that juxtaposes beautifully against Barry Doss’s gorgeous and ornate costumes. As the pounding dance music suggests, this is not a fussy production and Swackhammer makes sure that the cool vibe never diminishes regardless of the seriousness of the action or dialogue on stage. This is a play that is just as moody and surreal when a talking sheep strikes up an important relationship with Marie (trust me – it took me some time to buy into it, but it works) as it is during the brilliantly staged palace coup that has the rebels literally tearing up the stage in an incredibly genius and simple piece of direction and set design. The cast reacts to the unique script and production with effervescence and energy all around. Mitchell Greco has the difficult task of playing Louis as a kind of feckless savant child/man more interested in playing with clocks than with his wife or even France for that matter. It’s a terribly unlikeable and annoying character mold, but Greco brings a sweetness to the role that gives the audience a chance to root for him. Emily Neves as Marie is a study in range. This is a character that runs the gamut from bratty spoiled girl to feisty wife and Queen to beaten down woman with nothing else to lose. Neves is more than up to the task. She doesn’t so much change character as effortlessly slips into the changing situations her character finds herself in. Neves takes us on Marie’s journey and when the final moment comes, we are riveted. We are also relieved. As the final moment in this play, and the entire second act for that matter tends to drag on a bit long. We know where the story is going but it’s as though Adjmi punishes us just a bit for it by keeping us waiting through one too many scenes of imprisonment or dream sequences. While the effect is not quite shift around in your seat frustration, there is no doubt the production would pack a much stronger punch with a good edit nearing the conclusion. Like the talking sheep says to Marie, we all just need to wake up from this dream a little sooner. Again, trust me. It works.